A couple of weeks ago, I finished Batman: Arkham Asylum, and since then I’ve been struggling to come up with some anecdotal means of describing my experience with the game. I continued to put off the task as I played through the game a second time, but now that I’ve done that, the time is at hand for me to have an opinion. I’ll do my best. Of course, you might read that as me saying that it was terrible, but Arkham Asylum is far from terrible. Looking back, it seems to me that Rocksteady Studios took a lot of care in crafting an excellent Batman game. Let’s face it... there were a lot of ways that it could have gone wrong. Many have tried, and a small few have managed to make games that make good use of the license. 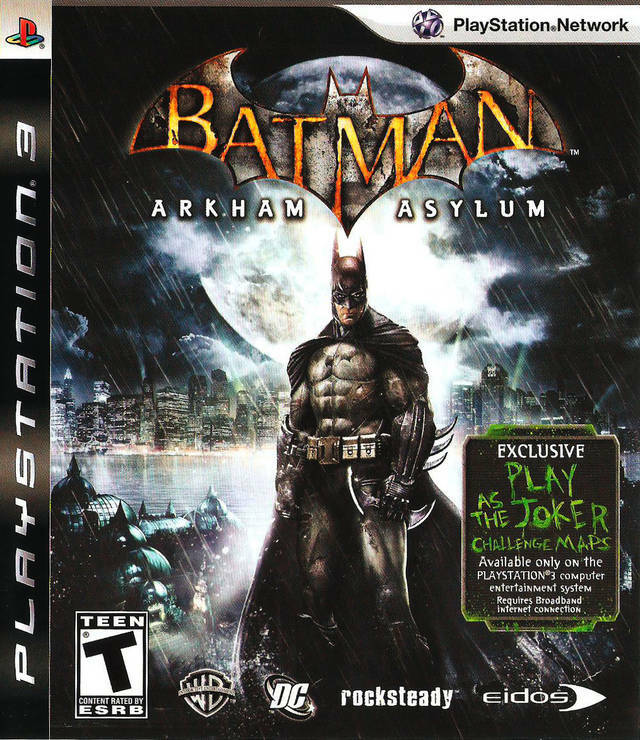 Rocksteady made nearly every smart decision that they could in the development process of Batman: Arkham Asylum from the choice to base the game on Batman’s rich comic history (as opposed to any of the movies) to approaching Paul Dini (writer of the beloved Batman: The Animated Series and Detective Comics) for the construction of the story to bringing in the iconic voice actors from Batman: The Animated Series (specifically Kevin Conroy as Batman, Mark Hamill as the Joker, and Arleen Sorkin as Harley Quinn) to voice the game’s dialogue. Did you notice that the paragraph above is just once long sentence with far too many parenthetical statements? Can you tell that I don’t do this for a living? Yet, any smart decisions pertaining to the atmospheric design of the game would be completely forgotten if the game wasn’t any fun to play. Luckily, this is not the case. I found the act of playing Batman: Arkham Asylum to be really enjoyable from beginning to end. One of my favorite parts of the game is the melee combat. At first it came across as a highly simplistic volley of attacks and counter-attacks, but as I progressed through the game I became accustomed the rhythmic nature of the combat system. Before long I found that I was able to take on larger and larger groups of henchmen by chaining together some pretty insane combos, which had me flying all over the screen and performing some visceral takedowns. At one point, I nailed a 46-hit combo, which yielded me a trophy! However, I occasionally came across rooms that were being patrolled by armed henchmen, who would take you down pretty quickly if they spotted you. These segments specifically force you to slow down and consider the movements of your enemies so that you can take them down without being noticed. And while this might not have been as exhilarating as beating the crap out of them, finding different ways to silently subdue enemies is highly satisfying. And this is where my experience with the game becomes rather difficult to characterize. In my opinion, the real unsung hero of this game is Arkham Island itself. It serves as setting, plot engine, and environmental puzzle all rolled into one cleverly designed entity, but it only works because every other part of the game interacts with it so well. 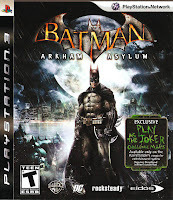 For example, Batman: Arkham Asylum uses the island to offer an open-world setting, while Detective Mode functions to keep you on track. When you switch to Detective Mode, Batman uses the sensors in his cowl to highlight points of interest (enemies, forensic trails, walls that are weak enough to be destroyed, ventilation shafts you can crawl into, etc. ), so you always know where the action is. If you explore the island in the early parts of the game, you can discover quite a few places that you can’t get to. And as you progress through the story, Batman’s gadgets are made available in such a way that you don’t even consider the fact that you’ve been handed a tool to get to some hard to reach place. This, of course, speaks to how brilliantly the game is paced. Nearly every time that I had to backtrack through any given area of the island, I just happened to have a new gadget that I could use to get to a previously unreachable part of that area. And on top of all of that, there is a sort of meta-game going on between Batman and the Riddler, who has scattered little Riddler Trophies across the island as well as riddles that you have to solve by snapping pictures of things that are hidden all over the place. Even after finishing the story, you can return to the island to continue finding all of these little treasures. Finishing this task, although somewhat tedious, yields a nice little treasure for fans. My time with Arkham Asylum felt like a highly directed open-world experience, which is a bizarre feat. During my first play through, I was having too much fun for it to have occurred to me how well the game was designed. But as I played again, I began to notice how subtly every part of the game fits together into an exceedingly cohesive unit. I can’t recommend this game any better than by saying that Batman: Arkham Asylum is not just one of the best comic hero games that I've ever played... it's one of the best video games that I’ve ever played. Your review actually makes me want to try it out. I'm a big Batman fan, but I never considered trying the game out even despite a few recommendations from friends - but the idea of a Detective Mode and how it works tingles my Bat senses. I don't normally take advice on people about games because the kind of games I like are typically more cerebral than just good games for violence - although I like Violence. Reminds me a bit of what I liked about Condemned: Criminal Origins and Condemned 2: Bloodshot - lots of brutal violence and sneaking around, then an abrupt switch to CSI. Although both games could use polish, it was enjoyable. Thanks for the recommendation.